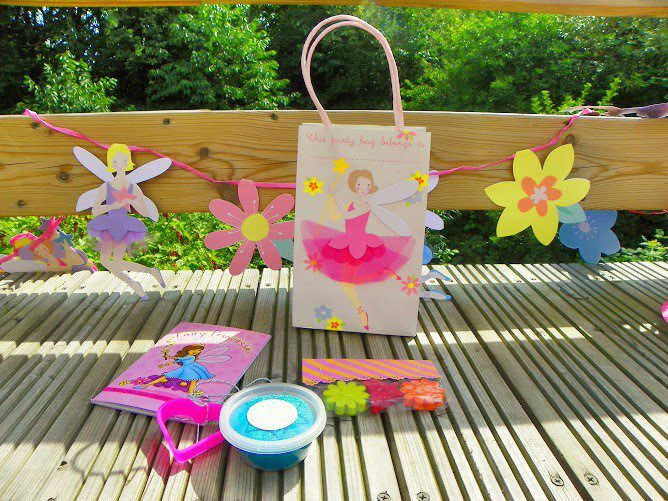 A few weeks ago, we were lucky enough to be sent a mini-party pack by the Great Little Party Company to review. The Great Little Party Company deliver traditional parties straight to your door – with tableware and entertainment all in one box. We were sent a mini fairy party box for two, and the girls couldn’t have been more delighted. In fact, they loved it so much that it has taken me rather longer than I’d hoped to review it. We have been playing with all the different elements ever since it arrived. They’ve taken them to friends and family and played with them at home and it has given them hours of fun. 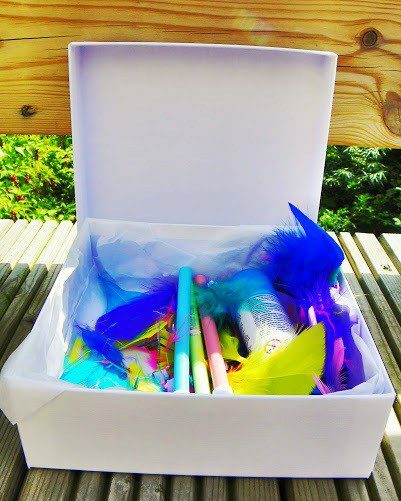 The box included fairy wings and a fairy house to decorate, feathers, jewels, glitter pens, felt tips, glue sticks, a game of pin the wand on the fairy and some toadstool stepping stones. 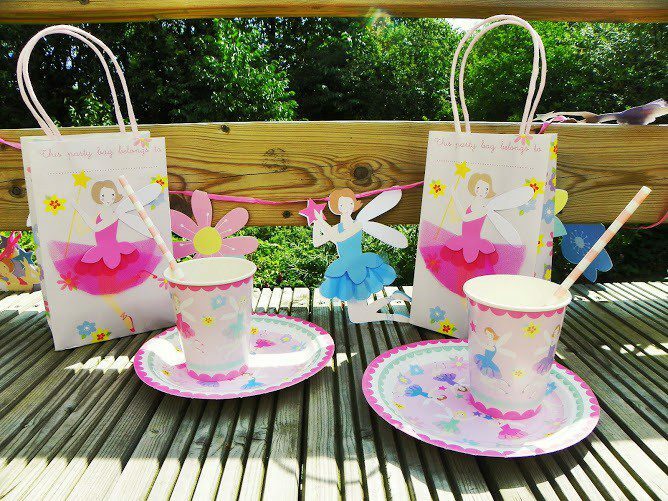 These were all in addition to the party bags, cups, plates, straws, serviettes and bunting that you’d need for a party. There really is enough to keep children entertained for several hours. The girls decorated a wing each on the fairy wings. They have so far only decorated one side, but it is adorned with feathers, glitter, jewels and an assortment of colours. They are both desperate to find the time to decorate the other side. We were all very impressed with the little wooden fairy house that they decorated with felt-tips, and they enjoyed playing with the toadstool stepping stones, making up their own game of musical chairs. 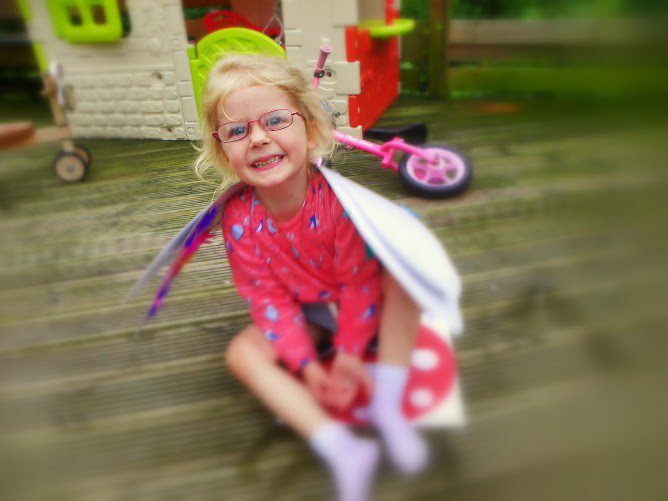 The toadstools are also ideal for pass the parcel or playing number or team games. 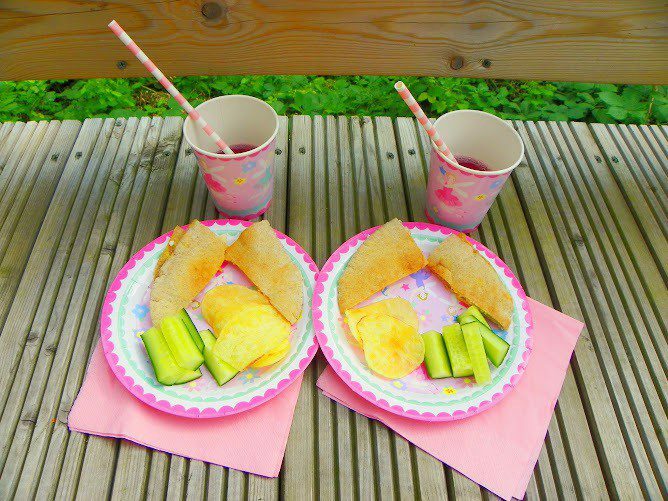 In terms of the party itself, the plates, cups, straws, party bags and bunting were all beautiful. The brilliant thing about the Great Little Party Company is that each box is personalised, so the party bags are age appropriate and cater for either gender. The girls particularly loved the bunting and are saving it to hang up in their bedroom when I’ve finished decorating it. 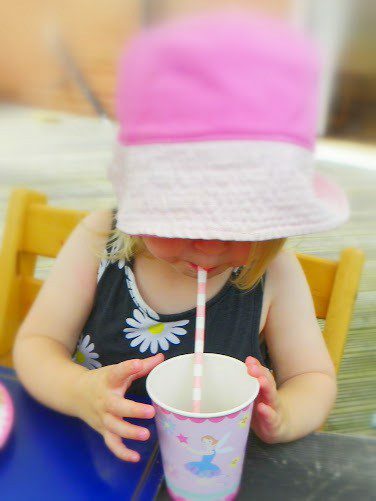 We would highly recommend the Great Little Party Company if you’re looking for a party at home that is completely organised for you. The girls have loved playing with all the elements of the party box, and they still have lots to do. 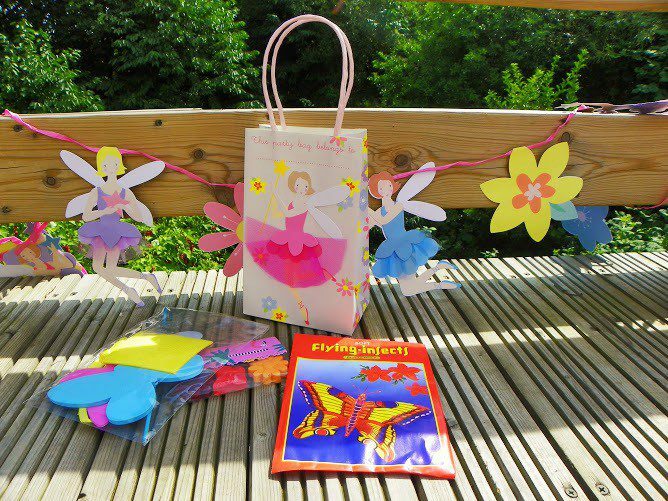 The pin the wand on the fairy game will be perfect for a day when they have friends round and they’ve put the fairy box on a post on the decking to see if any birds move into it – with the fairies of course. 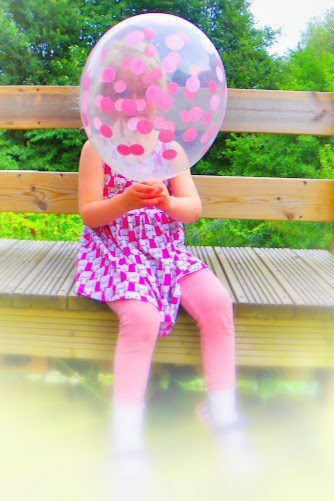 And the balloon has lasted really well, they’re still playing with it despite it having been blown up over a week ago. Please note, the Great Little Party Company sent me some product samples for the purpose of inclusion in this post. All views, opinions, images and delighted children are my own. If you would like to purchase a party box, please use discount code PARTY10 on the Great Little Party Company Etsy store. Thank you! I’m so pleased the girls loved the mini party box! Our discount is available until the 15th September. If there’s something particular you have in mind for an upcoming party, we can do our best to put together a bespoke party box for you. Just give us a buzz and we’ll chat through your requirements. My two love the party bags; it’s a wonder any make it out of the door. I always have to have extra for them to test out the goodies! Please let us know if you are interested in any of our party boxes.